High-resolution observations with the Atacama Large Millimeter/submillimeter Array (ALMA) imaged a rotating dusty gas torus around an active supermassive black hole. The existence of such rotating donuts-shape structures was first suggested decades ago, but this is the first time one has been confirmed so clearly. This is an important step in understanding the co-evolution of supermassive black holes and their host galaxies. "To interpret various observational features of AGNs, astronomers have assumed rotating donut-like structures of dusty gas around active supermassive black holes. This is called the 'unified model' of AGN," explained Masatoshi Imanishi　(National Astronomical Observatory of Japan), the lead author on a paper published in the Astrophysical Journal Letters. "However, the dusty gaseous donut is very tiny in appearance. With the high resolution of ALMA, now we can directly see the structure." 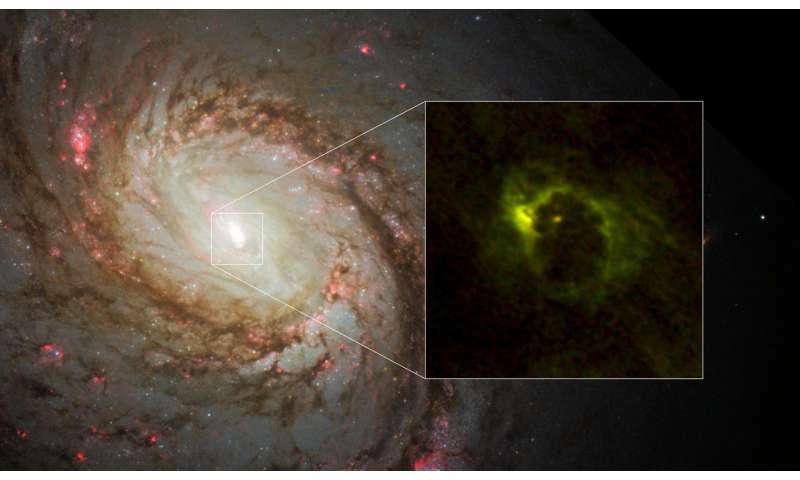 Many astronomers have observed the center of M77 before, but never has the rotation of the gas donut around the black hole been seen so clearly. Besides the superior resolution of ALMA, the selection of molecular emission lines to observe was key to revealing the structure. The team observed specific microwave emission from hydrogen cyanide molecules (HCN) and formyl ions (HCO+). These molecules emit microwaves only in dense gas, whereas the more frequently observed carbon monoxide (CO) emits microwaves under a variety of conditions. The torus around the AGN is assumed to be very dense, and the team's strategy was right on the mark. Interestingly, the distribution of gas around the supermassive black hole is much more complicated than what a simple unified model suggests. The torus seems to have an asymmetry and the rotation is not just following the gravity of the black hole but also contains highly random motion. These facts could indicate the AGN had a violent history, possibly including a merger with a small galaxy. Nevertheless, the identification of the rotating torus is an important step. So where's the image of the BH? I had high hopes of seeing it. Anybody have any idea why? Any idea why you had high hopes of seeing it, you mean? Because you are stupid, would be my guess. ......about the kind of response that could be expected by someone who has never seen a Differential Equation he could solve, or for that matter even identify & thinks it's part of an algebra course you take in high school. Sorry, D-K Benni, what sort of differential equations are you using that tells you that you ought to see this black hole? The one you failed to recognise, let alone solve, posted by 691 Boat, perhaps? I know dealing with stupidity makes you quiver. But have some decency for those who do not enjoy your fantasies... do not quote Benni please. I would not like to have to put you on ignore because you are an otherwise interesting person. But have some decency for those who do not enjoy your fantasies..
What 'fantasies' would they be? Mainstream science, and a complete disregard for woo? Do please explain. trekkie techno.......it's always same ones, like you just did who start these name calling binges, & then get all bent out of shape when the focus of the name callers challenges your math skills without ever resorting to calling you names. When the dagger is pointed right directly at the heart of your weakest intellectual skills, it's just so entertaining watching guys like you start using words like "stupidity", in the meantime never bothering with answering the question that was originally posed. I surmise you have this fantasy that NAME CALLING SKILLS are a better equivalent for DIFFERENTIAL EQUATION SOLVING skills. OK, what's the next name you want to call me? You've already used "stupid", next? If you would have such high regards for science, you would not discuss with Benni or cantdrive or any other weirdos of those kinds. They would disgust you and you would simply put them on ignore. I am not asking you to do that, I am just asking you to respect those who did. My first comment was highly sarcastic. I had no real intention to hurt your feelings but I wanted you to know that Benni's stupidity upsets me and seeing his comments pisses me off. Notice that I did not have to quote you to reply, I just directed my reply "@jonesdave". "The team observed specific microwave emission from hydrogen cyanide molecules (HCN) and formyl ions (HCO+). These molecules emit microwaves only in dense gas,..."
Read the paper. Dense is a relative term here and considering the distribution of gas is measured across parsecs, I would expect them not to be colliding to much extent if any. Why would these molecules emit light only in a "dense gas"? If you would have such high regards for science, you would not discuss with Benni or cantdrive or any other weirdos of those kinds. Fair enough. It's just that you wrote "your fantasies", which implied to me that you thought I was coming up with weird stuff! I have no doubt that whatever I write will fail to convince woo merchants liike cd that they are wrong. The main reason that I, and others (I presume), respond is mainly in the hope that others, who mightn't know the subject area, are not drawn into a lifelong belief in woo. Otherwise places like this just become free advertising for whatever woo these people are trying to push. I'll try not to quote them in future, so that you are saved from having to read their gibberish! Using sarcasm is a sur way to make people tick... I did not want my comment to fall unnoticed. Thank you for your understanding. Interestingly, the distribution of gas around the supermassive black hole is much more complicated than what a simple unified model suggests. The torus seems to have an asymmetry and the rotation is not just following the gravity of the black hole but also contains highly random motion. These facts could indicate the AGN had a violent history, possibly including a merger with a small galaxy. Again, the merger maniac reaches for the popular explanation. So how recent did this disruptive merger occur? Must be relatively recent since the relatively tiny torus still remains disrupted! More likely, is that the disruption originates from the supermassive grey hole itself, periodically ejecting newly formed matter therefrom. These ejections may likely include superwave cosmic ray ejections, that perhaps are non-uniformly oriented. Such ejections are likely responsible for accelerating the fast-moving gas clouds recently found within our Fermi Bubbles. I'm not sure about this, but 'dense' is presumably a relative term. ALMA is obviously measuring these lines in mm, or possibly sub-mm. My only experience of this is with similar detections in sub-mm at comets. You wouldn't call their comae particularly dense, but much denser than its surroundings. Satellites, such as ODIN, are well capable of detecting line emission from H2O, for instance. Albeit at closer distances. .....and there you keep rattling on with your name calling skills, "stupidity". Ok, so what are the limits of you math skills mister name calling expert? Ever seen a Rate of Reaction Equation you could solve? Do you even know what one looks like? I won't even bother to ask you about Differential Equations, you'll probably just end up embarrassing yourself like jonesy has been doing after flunking out of his one year stint at Uni in New Zealand, and he still won't tell us what curriculum he was in, only suggesting it was liberal arts. ^^^^^^What do you think, jackass, given that it is pretty obvious that my knowledge of astronomy & astrophysics is apparently well beyond yours? Googled "grey hole" and nothing came up. What's that? Most likely related to a bunch of pseudoscientific nonsense as pushed by a bloke called Paul LaViolette. I suspect that the supermassive core star itself is rather dim, allowing only a fraction of light to escape radially, rather than swallowing everything as the math fairies contend. It is far more logical that infinite density does not exist. Hence, I apparently have coined the term. ^^^^^So, that would be the fraction of light that is traveling at > c? Yep, that makes sense! Not. Which one of the 8 Unis did you spend the one year in? And why only one year? Was it so tough that you couldn't even survive beyond one year a liberal arts curriculum? Did you take any math courses during that one year stint at Uni? What do you do now other than spend a lot of time here going off on name calling rants? For what its worth, dummy, I spent 3 years in uni for my first degree, 4 for the second. Because it was an honours degree. Benni, you are obviously scientifically illiterate, so what does it matter? I already told you which university, dumbass. Have a look at their webpage for the early 80s. Can't help myself here. For sheet and giggles trivia, In my Complex Analysis course we proved the Riemann Hypothesis and then tested the RSA public key cryptography algorithm. There are 8 of them? Can you count that high? Or maybe you never knew there are 8 Universities in New Zealand? So which is the one of the 8 that you told us you attended for the year you told us you spent there? What was the curriculum in which you were enrolled? Why are simple questions like these so hard for you to answer? And when you are asked these questions why do you immediately start up on another name calling rant? Infinite density? What's that? Is this in reference to the black hole in the article or some of the posters here? Tuxfords' posts yielded some good side readings (thanks) like Fermi bubbles, infinite density and grey holes. Are grey holes older women who.....well, you know where I'm going with this one. By the way, infinite density (about the black hole) can't be proven, right? It can't be defined or something. By the way infinite density (about the black hole) can't be proven, right? Right you & Tux are, but in the world of Pop-Sci Cosmology there are these bitter clingers holding fast to 19th Century black hole theory whereby an Electro-magnetic Wave can be defined within the realm of the Laws of Physics for Kinetic Energy thereby subjecting an EM Wave to the same Escape Velocity equations as for particles of mass. Then in the 20th century, Einstein came along & spoiled the party proving that velocity of Electro-magnetic waves is not affected by anything to do with gravity. Einstein proved that gravity is MASS DEPENDENT, something that Black Hole theorists deny because they imagine Schwarzschild's Black Hole Math makes gravity appear out of nowhere simply by squeezing a CONSTANT MASS into a smaller volume. These BH Enthusiasts really do believe that you can take 100 atoms of something & squeeze it together so tightly that infinite gravity can be created. That was good Benni. I understood. Thanks. If I may, working under the assumption that the universe is a closed system (correct, yes? ), infinite mass or increasing, decreasing mass is not possible (energy conversion law). Therefore, infinite gravity would not be possible anywhere under any conditions despite what Schwarzenneggers' Black hole Math says. Yes? I tried to answer my own question about microwave emission from hydrogen cyanide molecules (HCN) and formyl ions (HCO+) and it becomes more puzzling. "The dust [assumed to contain HCN and HCO+] in close proximity to the mass-accreting SMBH is heated to high temperatures (>100 K) …"
Assume the average temperature is 150K so there will be very very few particles which have enough kinetic energy to have any effect. Calculating the "dense" density it comes out to 58,000 atoms per cubic centimeter. Interstellar space is about 1 atom per cc. 2nd assumption is that it is almost all hydrogen. Further, galaxy centers are intensely high energy X ray and UV light which busts up the molecules. Considering temperature, density, and quantity of HCN and HCO+ it doesn't seem you can get from here to there? Where is the logic flawed? Ask Benni, he's clever, he can do DIFFERENTIAL EQUATIONS! The only people you will find talking about 'infinite gravity' are not scientists. People like Benni and some 'popularizers' of science who don't quite get it might do so - but they are missing the point. .......for the most part you're probably right. eg, jonesdave, he's still trying to figure out if Differential Equations is an Algebra course taught in New Zealand high schools. People like Benni and some 'popularizers' of science who don't quite get it might do so - but they are missing the point. What's the "missing point" ? So can Turgent!!!!! and he's answering his own questions. I don't know if he's given himself the correct answers or not, but they seem reasonable enough to me, at the moment I'm just not all that interested in gas chromatography which is where he seems to be going here & then subjecting that to spectroscopy evaluation. He certainly seems to know more about what he's doing than I do. In LaViolette's SQK, our universe is a subset of a greater structure than cannot be observed. We can only observe the effects of the larger structure and thereby infer it's existence. Consequently, red and blue shifts, dark matter effects, finite light speed, time slowing, gravitational red shift, galactic cores growing on their own, widespread intergalactic gas clouds forming over substantial time, tenuous galactic halos, etc. As such, our universe is an open system, though I don't yet understand why it is not already full of matter? Maybe just too big? Looking at arXiv.org it would appear LaViolette had an Einstein golden year on its 100th anniversary of 1905. If I had to solve a D.E.today I would use the "DSolve" function in Mathematica. Just thinking about solving one today gives me a headache. So anyone who didn't make it past college algebra can solve a D.E. There is a free trial license. I read about LaViolettes' SQK. It's an interesting idea. However, 2 red flags popped up. First, SQK is described as a non-consevative model which violates the 2nd law of thermodynamics. Second, the theory proposes an ether like substance throughout its' model. Ether theories usually get trashed on this site. I'm going to read some read. .....an "open system" negates the 2nd Law of Thermodynamics, ENTROPY. Entropy is simply put, is DISTRIBUTION OF ENERGY. Dark Energy was concocted to come up with a OPEN BOUNDARY system whereby unending Kinetic Energy is continuously pumped into the Universe creating never ending expansion. The problem with the concept is Special Relativity, it would require INFINITE ENERGY to fuel never ending expansion, but the supply of the fuel source is limited to the available MASS which does not exist in infinite supply. You can't make the gas tank on your car infinitely big in size to kinetically power it an infinite distance, as soon as that tank is empty you stop soon thereafter. If I had to solve a D.E.today I would use the "DSolve" function in Mathematica. There is no shame there, everybody uses math engines. Would you believe that there are some dinosaurs here bragging to use the good ol' slide rule ? Would you believe that there are some dinosaurs here bragging to use the good ol' slide rule ? I don't think anyone would have trouble putting together a list of recent posts by this account that recall candid remarks by other posters with strange and creepy detail. This one marks a clear progression to demanding another user's personal details with belligerence under the pretense of damaged credibility for failing to comply; or stated more plainly, of failing to engage further. I dub thee Benni, Phys.org Social Predator 2018. It's so early in the year but this feels right. Willing to rename award if this is already a thing. I think we can also add lack of reading comprehension skills to Benni's failings. Anybody else read my original post, that mentioned AUCKLAND university? I realise that some of our American cousins aren't big on geography outside of their own country,, but AUCKLAND is a CITY. New Zealand is a COUNTRY. Maybe that'll help the terminally confused. ..........yet again you still REFUSE to tell what your major was. Why are you so unwilling to answer that question? You don't answer the question because you've been caught identifying Differential Equations as something you may have had in High School Algebra class, this drove a huge spike into your facade of science & math literacy & is the principal driver of your passionate & prolific foul mouthed rantings, simply because you're totally bent out of shape for having been caught portraying to be something you're obviously not. Let's just see how fast your foul mouth starts up again........I'm guessing immediately. Well then, I should ask you o'paradigm of math & science literacy: Have you ever seen a Differential Equation you could solve? This is just so entertaining watching the Copy & Paste geniuses stumble & stammer all over the place when they are queried to back up their competency to engage in their foul mouthed name calling rants, I know I've got them when they followup a competency challenge with an even greater crescendo of name calling rants, right? ^^^^Lol! This from a loon who has displayed no competency at all in various scientific areas. Who thinks that allegedly being able to solve DEs makes up for such idiocy as claiming visible light doesn't cause heating; that one should be able to see a black hole; and doesn't understand that detection of gravitational waves actually happened, even when we can see the progenitor of said waves! If anybody's competency needs questioning, it is D-K Benni's. This from a loon who has displayed no competency at all in various scientific areas. Who thinks that allegedly being able to solve DEs makes up for such idiocy, it is D-K Benni's. .......and you still won't tell us what your curriculum major was because you know you'd be embarrassed to admit it after having spent only a year at Uni, I remember that admission, only a year, What happened? Math is tough, right jonesy? Yeah, you found that out at Uni before you took a dive after only a year. ^^^^^^^ D-K Benji - nobody gives a tupenny %$^&** whether or you can or cannot do DEs, loser. What is painfully obvious is that your knowledge of the science that you comment upon is somewhere between sod all and zero. As pointed out repeatedly. What do you think, jackass, given that it is pretty obvious that my knowledge of astronomy & astrophysics is apparently well beyond yours? And throw in a fair bit of geosciences. Second degree, D-K? Well, that was something of a refresher, and purely out of personal interest. It was an 'open' degree in which I studied all sorts - from evolution to oceanography - statistics to volcanology - planetary science to geology. Now, what relevant qualifications do you have to talk about climate science, cosmology, astrophysics etc, etc? It is more than obvious what the answer to that is. Zilch. Six years in Engineerig School majoring in Nuclear/Electrical Engineering, then almost two years of continuing education credits beyond that, nearly 8 years total higher education credits in Engineering. ......so why do you still only keep "hinting"? Oh, by the way, again, when did you take that course in Differential Equations? High School you told us previously, I just wanted to see if you're memory is still serving you well. So, precisely zero. As I thought, and is bloody obvious from your post history. I read about LaViolettes' SQK. It's an interesting idea. However, 2 red flags popped up. First, SQK is described as a non-consevative model which violates the 2nd law of thermodynamics. Second, the theory proposes an ether like substance throughout its' model. Ether theories usually get trashed on this site. You will likely need to be either well-grounded in systems theory or control systems, or it will bypass your insight. Ah yes, the laws. Nature is not Texas. It doesn't care about human conclusions. It is what it is. Do you want to understand nature, or adhere to THE law?? No violation in an open system. Ever-present etheric sub quantum components cannot ever be observed. Their propagating transmutation reactions are what constitute a sub-atomic particle, speeding around up to light speed. The initiation of a new reaction, then, is matter entering our observable universe. It turns out that the most fertile conditions are inside star cores. ........and you still won't tell us what curriculum you were enrolled in for that one year you spent at Uni........and are still having memory recall as to what year in High School Algebra class you took that Differential Equations course in the 70's. ^^^^3 years, sh*t for brains, which is likely 3 more than you've done. Certainly in any relevant science that you comment on, in your D-K inspired ignorance..And I told you Captain Alzheimer's, read the frigging post. You are now on ignore, you braindead idiot; Personally I think you're mentally ill. Have you ever made a post that didn't mention differential equations? Which DE did you use to figure out that visible light doesn't heat things? Or that you can't understand why you can't see black holes? Hint: there's a clue in the name. I'm figuring the only time you've been in a university was to mop the floors. "You will likely need to be either well-grounded in systems theory or control systems, or it will bypass your insight. Ah yes, the laws. Nature is not Texas. It doesn't care about human conclusions. It is what it is. Do you want to understand nature, or adhere to THE law??" My last post was done with a newbies scientific approach using what I've learned. I tried to stick to logic. Actually, the intuitive side of me somehow understands this very well. Contemplating this SQK, I think I understand it on a 'Nature' level. This intuitional understanding of mine serves to inspire me to read even more as the worlds scientists search for the universes'... 'Primer'. Thank you again. Without disregards, I think that coming back on a subject we already discussed and where we seemingly understood our differences is somewhat odd. Might it be that I understood your position but did not made mine clear enough. Also, when I say that I understood your position, it does not mean that I agree with it, it only means that I respect it. That is what democracy is all about. _I am here because I groove on a multitude of scientific topics. _I very much enjoy engaging extensively with other posters but it is very time consuming and I have limited time to give. This being said I did it on a few occasion but always had to bring it to a premature conclusion... I am sorry about that. _Like many of you, I am frustrated with the lack of respect that the scientific community gets on Physorg. But unlike many of you I do not feel any urge to engage in nonsense. (That is where I asked jonesdave to spare me). I am comfortable with the tools that PO gave me to dismiss the windbags that pollute this site. Unfortunately the extensive habit to quote limits the "ignore" function... It would be very nice if PO upgraded this function to recognise and blank the quotes that one does not want to see. _I hate when I see a bright comment lost in a sea of nonsense. I have seen wonderful comments left unaddressed because nonchalant others where jazzing with mumbo jumbo. A final not especially for you CS. Talking about Thundeef00t, this demagogue is no yardstick for me.